Skills and Abilities: As an aborigine of Australia he is a proficient hunter, tracker and has knowledge of the old ways. He is also a skilled teacher having taught Eden Fesi and the M-Twins. Powers: Gateway is attuned to the forces of the earth allowing him to teleport from one location to another. There is no limit to the amount of mass he can teleport or what distance. He can transport people even across time and into different dimensions. To summon these “gateways” he normally swings a bull-roarer above his head. He can also use these portals to look at past or future events. Gateway also has telepathic abilities allowing him to send or receive the thoughts of others [Uncanny X-men v1. #230, Generation-X #1, #5 and #7, Uncanny X-force 0.5]. It is unknown if this is a part of his mutant power but he has Eidetic/Photographic/Total Recall memory. This give him limitless knowledge as everything that he observes through portals or around him remains with his always. In the Age of Apocalypse he is described as “the repository of the knowledge of humanity, the living index of every hard-earned scrap of information gleaned in our ascent from mindless savagery.” [AOA Weapon-X #3]. The man who would come to be known only as Gateway has a past shrouded in complete mystery. He appears to be in his 60’s or 70’s but because of his ability to travel through time and space he may well be an ageless immortal. 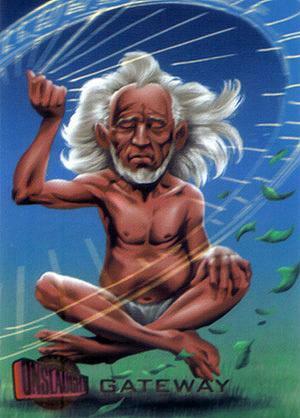 As a member of the Aborigine people of Australia he is an elder and shaman. After being blackmailed by the Cyborg villains known as the Reavers who threatened to destroy land his people deemed sacred he agreed to work with them. His people believed ‘would cause his ancestors souls to wander the dream lands aimlessly until the end of time’. Essentially enslaved by the Reavers it was his job to take them to and from their criminal missions. It’s unknown how long he remained in servitude to the villains. When the outlaw X-men engaged the criminals in battle and they were losing, they begged Gateway to transport them away and “All debts would be squared” [Uncanny X-men v1. #229]. Freed from servitude he remained and watched the X-men before he began working with them to atone for the crimes he had been apart of with the Reavers [Uncanny X-men v1. #230]. Gatway became an unofficial member of the X-men as he transported them from their missions. He also grew especially close to Rogue who would bring him food and who he would play music for. Despite this however he used his dream time powers to watch the corruption of Madelyn Pryor by the demons of Limbo but chose to tell the X-men nothing [Uncanny X-men v1. #232-234]. He also taught Longshot to access the dream time revealing an emptiness inside the young man and questions about his past. Longshot as a result quit the team [Marvel Comics presents v1. #16 and Uncanny X-men v1. #248]. Gateway also secretly transported Jubilee to the X-men’s base where she remained unseen for weeks. 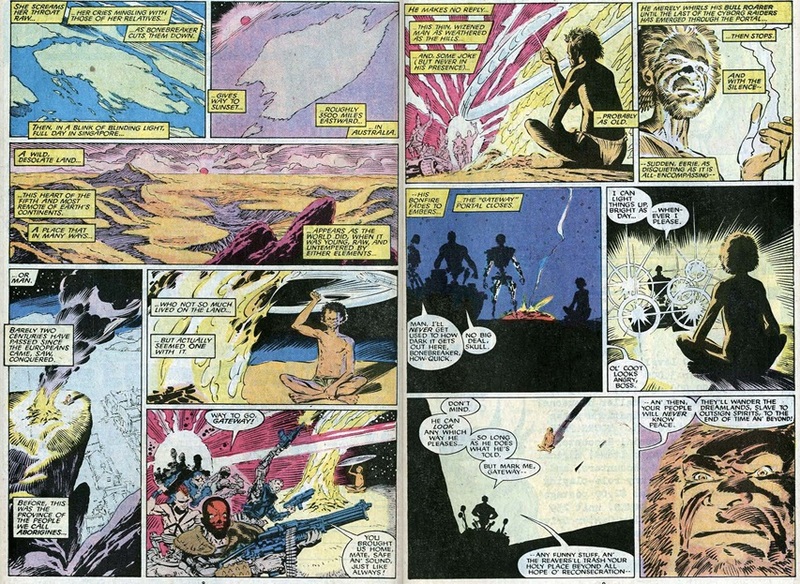 When the Reavers returned lead by Donald Pierce Gateway sent a precognitive vision to Psylocke through the dream time. As a result the team escaped through the Siege Perilous before the Reavers could enact their revenge. Wolverine however was caught and tortured by them but was saved by Jubilee who Gateway had kept hidden [Uncanny X-men v1. #250-252]. Gateway was again forced into the servitude of the Reavers. Rogue came upon Gateway again when she was defenseless and was forced to absorb his powers to escape when he refused to co-operate. She vowed to return for him but never did [Uncanny X-men v1. #269]. When the Reavers were attacked by reprogrammed sentinels they were outnumbered and on the losing end so Donald Pierce had Gateway send him to the one responsible. This was Trevor Fitzroy (His grandson Bishop’s arch nemesis) who was attacking the Hellfire Club and the X-men. During the ensuing battle the Hellions were killed and Emma Frost rendered Comatose [Uncanny X-men v1. #281]. Weeks later Jubilee was sent into the past by Gateway to witness the real reason her parents died while she and wolverine checked the Reavers abandoned base [Wolverine v2. #72]. When Generation-X was formed he transported Monet. St. Croix to Generation-X after training her sisters the M-Twins [Generation-x #1, #2, #5 and #7]. This was done as “Penance” for the crimes he had been party to in the past.Gateway then transported Storm, Wolverine, Cyclops and Iceman to an unknown dimension where they faced Post an emissary of Onslaught. This was done to alert the X-men to the impending villain’s power [X-men v2. #50]. Gateway would later reveal the identity of Onslaught to Wolverine by Transporting him back to the moment of the creature’s creation [Wolverine v2. #104]. When Black Tom Cassidy attacked Generation-X Gateway departed knowing his time with them had come to an end [Generation-X #25]. Gateway then provided transport for Wolverine and Jubilee so they could stop Donal Pierce from becoming an indestructible Adamantium Cyborg [Wolverine v2. #141]. When the X-man Psylocke had been killed he appeared to Storm’s X-Treme X-men and pulled Bishop into dream time to let him know he was his grandfather [X-treme X-men #4]. He reappeared in the service of the Reavers again and at the end of the battle handed a volume of Destiny’s diaries to the X-men [X-Treme X-men Annual 2001]. Mr. Sinister ordered his death during the Messiah Complex crossover because of his ability to perceive the future. He was reported dead but this was false [X-men v2. #202]. Returning to the Australian outback he mentored fellow Aboriginal Eden Fesi who had reality bending powers. He allowed Eden to leave telling him to stay with the “woman’s team” and not “Nick Fury’s” because she would protect him [Secret Warriors #4]. His advice was sound as Fury’s team were all killed in action while Eden’s survived. Knowing of his proficiency the Reavers again targeted Gateway this time threatening to kill his tribe unless he co-operated. Their plan was to blow up the mutant island nation Utopia with his help. He telepathically gave Psylocke this information and then aided them in stopping the Reavers [Uncanny X-force 0.5].